The Eddie Bauer Short Sleeve Performance Fishing Shirt Style EB602 is available in Adult Sizes XS-4XL. It can be purchased in your choice of the following colors: Boulder, Driftwood, Gulf Teal and White. Defend yourself from the sun, sweat and odors in our super lightweight, high-performance fishing shirt. 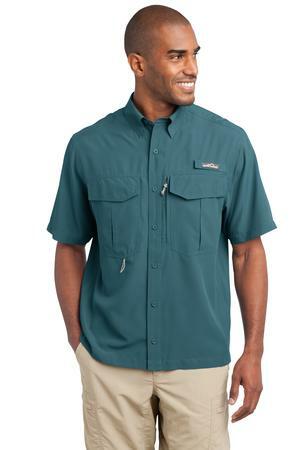 This Short Sleeve Performance Fishing Shirt offers UPF 50+ protection and a moisture control system that actively moves moisture away from your body to keep you cool, dry and comfortable. Microban® – technology minimizes odors. It is made with 2.3-ounce 100% polyester ripstop with a 100% polyester mesh upper back lining. It features a sun shield collar, built-in rod holder, two large fly box pockets with hook and loop closures, zippered chest pocket, a utility loop and tool holder, cape back with mesh ventilation, and hook and loop-fastened collar points. Be the first to review “Eddie Bauer – Short Sleeve Performance Fishing Shirt Style EB602” Click here to cancel reply.